A pacemaker is a battery powered electronic device that can be implanted into the body to treat slow heart rate or bradycardia. A pacemaker system consists of a pulse generator and lead or leads connected to the pacemaker in order to pace the heart chambers appropriately. Single chamber pacemaker system has one lead, dual chamber pacemaker system has two leads and biventricular pacemaker system has three leads. The pacemaker can be programmed using a programmer which communicates to the pacemaker wirelessly and adjustment can be made to pacemaker programming setting as determined by the clinical needs of the patient. The pacemaker system monitors the heart rate and paces the heart according to the program set by the programmer during each pacemaker check. Preventative antibiotic usually is given before pacemaker insertion to avoid infection from occurring. This is usually given intravenously. Local anaesthetic is used to infiltrate the area just below the collarbone usually on the left side just under the skin. An incision is then made to create a pacemaker pocket under the skin. 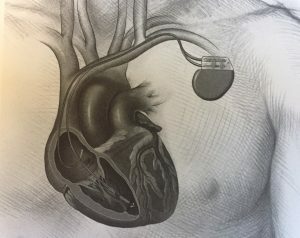 The pacemaker is inserted under the skin and connected to two pacing leads or wires connected to the heart chambers. The leads are inserted by accessing the vein that runs under the collarbone and xray was used to visualise lead positioning. Once the leads are positioned in the heart, the leads and pacemaker are tested to make sure they are working properly before skin closure using absorbable sutures. The pacemaker system will be checked regularly in clinic and the pacemaker battery usually lasts between 8-10 years. It cannot be recharged and a new pulse generator change will be required when the battery is near depletion. Local anaesthetic is used for this procedure and sedation will also be given for patient comfort. It is not advisable to drive for two weeks after permanent pacemaker insertion. Bruising and bleeding in the pacemaker pocket. Pacemaker lead migration requiring lead repositioning. Unexpected pacemaker or lead failure requiring replacement. Blood clot in the vein or deep vein thrombosis (DVT). Blood clot in the lung or pulmonary embolism (PE). Today’s devices have many features which assist patients. At CHC, the effective programming of the device will help optimize performance and generally prolong the battery life of the pacemaker. Let’s see what your device can do for you!